Mumbai: Outstanding bank loans to industries in Maharashtra fell for the first time in close to 30 years in 2017-18, Reserve Bank of India (RBI) data showed. This assumes significance as Maharashtra accounts for 28% of all industrial loans in India. 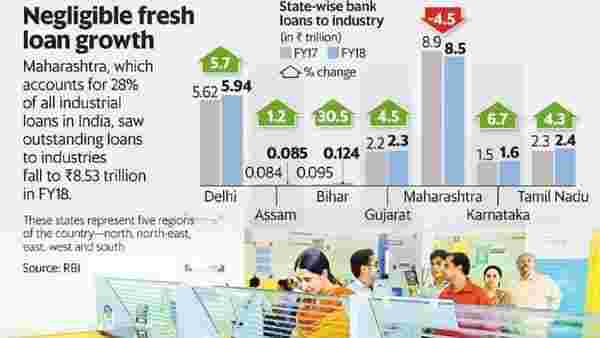 Outstanding loans to industries in the state grew steadily since 1990, but fell 4.5% year-on-year (y-o-y) in fiscal year 2017-18 ( FY18), the latest period for which data is available. Total loans to industries in Maharashtra, which stood at ₹8.94 trillion in FY17, dropped to ₹8.53 trillion in FY18, showed RBI data on state statistics. This means that while old loans have been recovered to an extent by banks, fresh loan growth was negligible that year. The slowdown is not because of any particular event that occurred in 2017 or 2018 but is because of factors that have been seen for quite some time now, according to Raj Nair, president, IMC Chamber of Commerce and Industry. “Factors leading to this have been witnessed for the last few years and these have now manifested. It is not as if loans to industries in the other states of the western region have fallen. It seems to be a very Maharashtra-specific problem,” said Nair. This is not because Maharashtra is not doing enough, but because others are doing better in attracting investments, Nair said, citing data on Gujarat where loans to industry rose 7% y-o-y to ₹2.35 trillion in FY18. “The number of factories in Maharashtra has declined from 28,210 in FY16, to 27,010 in FY17 according to the Annual Survey of Industries (ASI). This has been happening for a few years now and this could be the reason why borrowing from banks has reduced,” said Nair, adding that other states are very aggressive in attracting businesses. This data, however, does not account for loans from non-banking financial companies (NBFCs), and experts said it would not be a substantial portion of the total loans. This dip occurred in a year when aggregate loans to industries in India grew close to 2% to ₹30.38 trillion. As a result of the decline in Maharashtra’s outstanding loans, the western region, comprising Goa, Gujarat, Maharashtra, Dadra and Nagar Haveli, and Daman and Diu, saw the first decline since 1994. Others believe that several small and medium companies have moved out of Maharashtra to neighbouring states, drawn to incentives. Several companies in Maharashtra are unable to afford expensive land and labour, and are, therefore, moving to other states, said Chandrakant Salunkhe, founder and president, Maharashtra Industrial and Economic Development Association. “Companies from the Vasai-Virar regions are moving to Gujarat. Some companies from Nashik Jalgaon are also moving to Gujarat, Some companies in the pharma sector are moving to Vapi and Silvassa,” said Salunkhe. Some companies in western Maharashtra areas such as Pune and Kolhapur have been invited by the Karnataka government to set up facilities in Belgaum, said Salunkhe Firms from the Nagpur region are moving to Chhattisgarh and Madhya Pradesh because of their incentives, he said. The dip could be a result of wariness on the part of banks to lend to industries, following the accretion of industrial bad loans, according to Sugeeta Upadhyay, deputy director, Bombay Chamber of Commerce & Industry.